Kieli, a lonely girl with the power to see ghosts, encounters a man named Harvey, who happens to be one of the legendary Undying. The Undying were soldiers made from recycled corpses that were trained to be immortal killing machines in a violent war 80 years ago. She follows Harvey on his journey to return the ghost of a soldier, who died in that war and has since been a possessing a radio, to his grave. 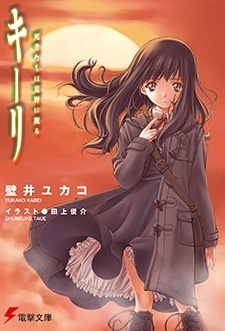 Kieli was published in English by Yen Press from July 14, 2009 to September 24, 2013. I stumbled across Kieli's story by accident. With a bit of free time on my hand and the thought that seven chapters is not too much too read I decided to read the manga – and found myself drawn into it at a very fast pace. Afterwards I was really sad to see the story ending at the short amount of seven chapters – and thus very happy to find out there was a series of novels continuing the story of Harvey and Kieli. Now I'm up to volume 3 and waiting for number 4 to arrive at my home. In the meantime I decided to write a review. I'll try to keep it spoiler free, since there's none here so far and surely people reading this don't want to have the events outlined for them but a reason to pick up these books and see for themselves. Story: The story itself is nothing THAT new. An as good as immortal guy meets a young girl who is able to see ghosts and they somehow end up travelling together. Third member of the party is indeed quite unique: the ghost of a dead soldier possessing an old radio. Which made the novels a really appalling read this far was the mix of different atmospheres they were able to create. There are actions scenes which make a good use of Harvey being an nearly immortal person … Sometimes quite graphic (bugs that crawl from a wound in the chest through the body ending up somewhere at the wrist and eating themselves out of the body again) they stand in contrast to the scenes in which the relationship between the three protagonists develops. It's not easy to describe the tone of these moments without giving away too much but they do quite well in stirring up emotions. Exploring your own past. Facing it. Feeling the loss of an attachment to the world you're living in. Missing chances and knowing that you won't get another one. Helping someone to move on. Bringing yourself to trust in someone. The novels do a really good job at portraying all of these. The setting is another factor that has taken me by surprise. I thought it to be just another near-or-not-so-near-future-setting but it has developed into quite something containing elements like a fanatic church, quite mad scientists, 70 percent of the planet's surface consisting of desert and – eventually – a space ship. Yep, a space ship. Characters: They make this whole thing work. Harvey … Well, Harvey. He is really up on the character development thing. It goes up and down and up and down. And sometimes you get the feeling that he's going round in circles. But maybe that happens, if you've been on “earth” far longer than any normal human being should have been. One of the supporting characters once says something about him really not being able to stand being left behind once again, and that pretty much sums it up. Harvey knows that for himself and at the same time he has a gruesome past to deal with, a bunch of really bad lunatics going after him (and they are pretty much everywhere) and to fight the question he is constantly asking himself: If he really wants to keep on doing this. And this gets me every time. It's a kind of helpless feeling seeing him try to bring himself to snap out of his indifference, but not really finding his reasons for moving on, for helping people or even feeling for them. Completing the trio is the Corporal – and I love him! He is the spirit of a soldier who died by Harvey's hand and made him swear to take him back to his grave. Meanwhile he's possessing an old radio and being pretty much everything an old guy possessing a radio should be: Quite grumpy, kind of bitter about his situation but at other times strangely at ease with it, understanding and friendly towards Kieli and constantly going on Harvey's nerves (in an entertaining way) but also able to talk some sense into him if necessary. The three of them form a really likeable trio and I find myself turning the pages and really wanting the best possible outcome for them – and I'm not always this dedicated to wishing characters only the best. I have to really like them for that. Only thing a bit annoying: Sometimes one of them thinks: “Well, seems fishy. Something bad could come out of it.” But they still go on the same way and guess what – something bad comes out of it. Yeah … Can I smack you? Oh, you're down already. … Then I'll just hope this will turn out okay in the end. Art: Well, it's a novel … Still. Each volume contains some really beautiful colour pages at the beginning. Actually my first thought upon opening was: “Well, buying that was worth it.” Plus there are some illustrations throughout the novels and art and story go really well together.